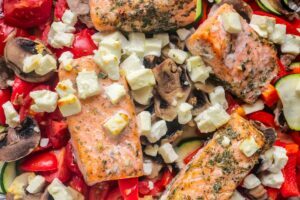 May is International Mediterranean Diet Month and here at Food & Friends, we tailor our meals to follow the principles of this heralded way of eating. 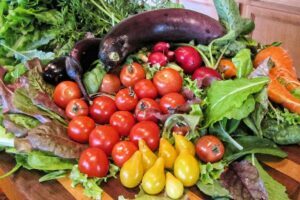 The Mediterranean Diet emphasizes foods high in antioxidants, fiber, and healthy fats, including whole grains, fruits, vegetables, beans, herbs, spices, nuts, fish, and olive oil. Additionally, it recommends eating yogurt, cheese, poultry and eggs in moderation and red meat and sweets much less frequently than the average American diet. Omega-3s: These are fatty acids found in fish, shellfish, walnuts, and olive oil. Consuming omega-3s regularly can decrease your risk for cardiovascular disease, cancer, and Alzheimer’s disease. Antioxidants: These come from many foods in this diet. High levels of antioxidants can reduce your risk for developing Parkinson’s disease and cancer. Fiber: Due to this diet revolving around high amounts of fruits, vegetables, whole grains, and nuts, it is very high in fiber. 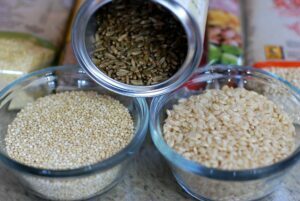 Fiber can protect against the development of Type II diabetes, high blood pressure, and inflammation. It also keeps you fuller longer! Here are some items you can buy at the grocery store to make your own Mediterranean meals!